I can't believe it's been a week since I shared an outfit post with you guys! I feel like I was on kind of a roll with sharing these posts up until we all got sick. It's funny, while Steve and I were shooting this look, we got a call from Vivi's teacher saying that we need to come and pick her up since she's sick. We had to wrap up the shoot real fast and didn't get all of the shots that I had wanted for this look (one of my faves to date! ), but I think it turned out okay. The minute I saw this top at Target I knew I had to get it. The bell sleeves or any kind of dramatic sleeves/cuffs is going to be a huge trend this season and rightly so. It's so flattering and feminine, and with having to wear more layers during the cooler months, it's a nice added embellishment. Since it was still warm when I purchased it, I wanted to show how you could wear it with some shorts. This is definitely a look that I would wear all the time if I could. The cutoffs give it a bit of edge, but then I polish it up with some lady-like heels. And FYI, these Zara Heels are only $40 and make any outfit look so put together. And to add a bit of playfulness to the look, I added these Baublebar Crispin Earrings. How fun are they? They're an inexpensive version to these ones, but I think they're a bit more wearable for everyday, don't ya think? 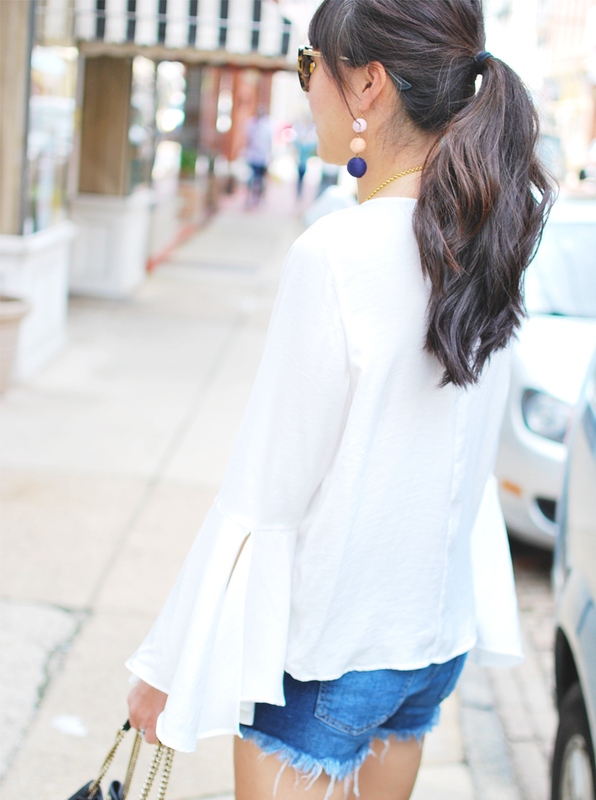 Are you guys fans of the bell sleeves? Would you wear them? Let me know, really curious to know if you're into this trend or not.